The systemic financial risk-taking in the lead-up to the financial crisis was a product of untouchable insiders taking risks that favored the connected few. And the many still suffer. We need to make sure those who do the people’s work in Washington are actually doing it – not worrying about former or future bosses at the public’s expense. Clinton struck at the heart of pervasive problem of multi-level cooperation in large organizations of all types; when favorable coordination within well-connected sub-groups of ‘insiders’ comes at the expense of the organization or public at large. I call this specific type of coordination back-scratching, and it can occur wherever there is the ability to make and repay discretionary favors to select others. Not only are there insider groups bridging Wall Street and financial regulators, but Defense Departments globally are a hotbed of revolving personnel into, and out of, private weapons and hardware manufacturers. 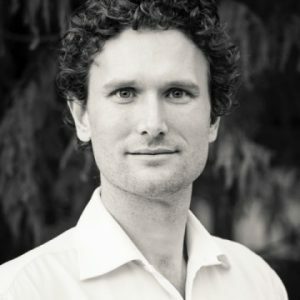 At local government levels this type of revolving door of well-connected insiders is even more insidious, with land rezoning and infrastructure spending a constant battle between in the interests of the insiders and the community at large. The revolving door culture is now so pervasive that Federal Reserve Chairman Ben Bernanke, arguably the most powerful financial regulator in recent history, waltzed through the door to consult for a multi-billion dollar hedge fund with almost no media criticism. Few issues are more important than being governed in the interest of the few at the expense of the many. The economic costs of this behavior are likely to be in the hundreds of billions of dollars annually. Yet from a standard economic viewpoint, the mechanism by which such favoritism occurs remains a mystery. To shine some light on the mechanisms in coordinating back-scratching, its costs, and potential institutional changes to combat it, I took the problem to the lab under computerized experimental conditions. While the results confirm a lot of common sense intuition, they are a leap forward in terms of our economic understanding of the problem. Regulatory capture is the name economists give to the perverse effects of the revolving door, yet its effects on behavior are not the product of a coherent theoretical framework. For regulators to act in the interests of their former, or potentially future, employers requires a level of implicit collusion that shouldn’t exist in a world of purely self-interested agents who would defect from any attempt to form a group of allied insiders. Something else must be going on. Another view in standard economics is that political favors are imagined to be auctioned by way of a lottery, where bidders devote their resources to non-productive activities, such as attending political fundraisers, up to the amount of their expected payoff from the political favor subject to the participation of others in the lottery. This is called rent-seeking. The prize of a political favor is open to anyone, and we should expect, just like we see in real lotteries, no specific entrenchment of particular interest groups and a high degree of randomness in allocation of political favors. The amount of resources devoted to winning the lottery for political favors are too low for the size of the favors. If this is truly how winners of political favors are determined, then politicians are being highly irrational by not extracting larger tributes from the lottery participants when they are able to. It would be like repeatedly running a lottery with a $100 prize and selling just $5 worth of tickets. It makes no sense, and still leaves $95 of the political gift unexplained, suggesting there is still a missing element at play in political favoritism. If political donations are a way to purchase lottery tickets for political favors, then the way donors choose to split their donations amongst political parties should merely follow political polling as donors seek to ensure they are entering a lottery with a genuine future payoff. Yet this is not the case at all. 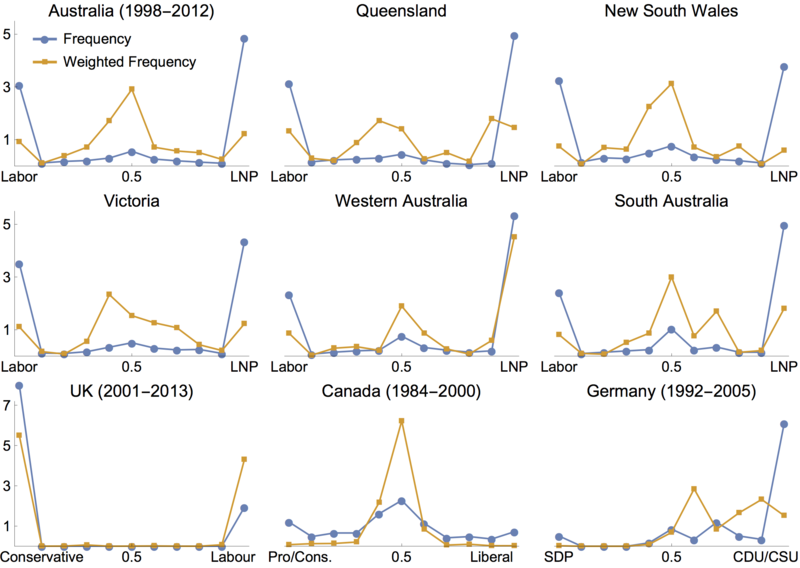 The image below shows the frequency distribution of donation shares between major parties amongst political donors in Australia (and its states), Canada, the U.K. and Germany. The blue line is the frequency of donations at each split between parties. Looking at the top left panel we see that around a third of political donors give 100 percent of their donation to the Labor party in Australia, while around half donate exclusively to the Liberal National Party (LNP). However, there is a small group of donors who donate equally (at 0.5) to each party. We see a clustering of donors who split their donation between major parties 50:50 in Australia and Canada, and at 60:40 in Germany, along with the lack of clustering in the U.K. The orange line weighs this frequency by the monetary size of the donation by each donor. Donors who split their donation 50:50 donate more money than those who are loyal to one party of the other, as seen by the higher orange line around the 50:50 mark. Such patterns simply cannot be predicted by rent-seeking theory. From an evolutionary perspective however, these problems fade away. We no longer have a world of politicians and regulators seeking to extort the optimal price in a lottery for their political favors. Nor do we have a world of irrational regulators cooperating with former employers when they should instead defect. What we have is a world of tribe formation through the reciprocal exchange of favors. Political donations can be seen merely an entry fee to these tribes; an identifying marker, or to borrow a gang analogy, a hard-to-fake “facial tattoo” signaling future loyalty. In keeping with this reasoning, politically stronger groups may have higher entry fees, which can explain the dominance of a 60:40 split in Germany. Rather than an unexplainable curiosity, the clustering of political donations split 50:50 simply indicates these donors are paying entry fees to roughly equally powerful political tribes on both sides of politics. The majority of donors remain members of one political tribe only, donating exclusively to them regardless of political polling. Looking at the revolving door through the evolutionary lens of group formation we get a real sense of the underlying conundrum expressed by Clinton. Do regulators revolving into positions of power already have implicit loyalties to their tribe, providing back-scratching favors to them when possible? And can these loyalties be overcome in order to act in the interests of the public at large, even when it comes at a cost to their tribe? Should we also be looking for other signals, or identifiers of loyalty to one tribe or another from key personnel in regulatory agencies? These are important questions for evolutionary social scientists. Studying back-scratching in the wild faces a major problem. Political favors are almost impossible to objectively observe. Not only is there a powerful incentive to conceal favors, determining the ‘no favor’ counterfactual is almost impossible. Was the government contract given to the most efficient firm? Or was it a favor to the winner, which we know for sure because we have information about an alternative bidder who could have delivered a better outcome for the price? More often than not we just don’t know. I designed an experiment that captures the minimal example of a back-scratching group of elites, with four players who over the course of the game are able, if they choose, to favor other players (which I report in this working paper). If these favors are later repaid we see that a sub-group that favors the two insiders at the expense of the outsides can emerge. This is fairly close representation of political parties and their industry connections become loyal and tribe-like through repeated favor exchanges. 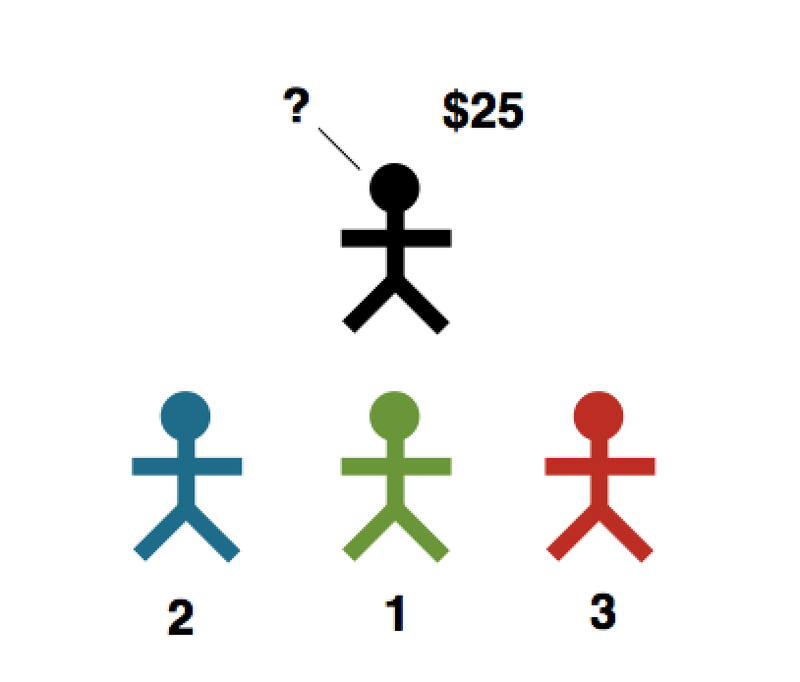 In the basic experiment, one player is able to choose which of the others to receive a prize of $25 in a round (in experimental currency). The payer who receives the prize allocates a fresh $25 the next round to one of the other three. To profit-maximize in this situation it is best to form a back-scratching alliance with one other player and trade the $25 favor back and forth. Over 25 rounds an alliance pair would make $625, while the other two would make nothing. What makes back-scratching costly to the group as a whole is that each of the potential recipients is given a randomly shuffled ‘productivity number’ each round, either 1, 2 or 3, which determines a payoff for everyone in the group (see the image below). Each player gets an amount equal to the receivers productivity number in a round. Give the prize to the player who is 1, the group gets $1 each. Give the prize to the player with 3, the group gets $3 each. Think of this productivity number as reflecting the efficiency of firms competing for a government contract. To sustain a back-scratching alliance means not choosing the most productive player for the prize in two-thirds of the rounds. It earns the alliance $725, the outside group $100, and comes with an efficiency loss of $100 to the group of four as a whole due to the repeated non-productive choices, which is shown below as the emergence of a loyal sub-group. It turns out that 84 percent of groups formed costly tribe-like alliances at some point, even though the participants were young honest university students who were anonymous. In real money terms (rather than experimental currency) alliance pairs ‘stole’ $30 from the outsiders to increase their alliance earnings by $20. I also formed groups where I primed subjects before the game. They read a brief recount of their imaginary ‘in-game’ relationships with a connected partner, effectively being told that one of the symbols was their friend that helped them in the past. As you would have guessed, this increased the number of rounds of favors substantially; from 28 percent to 62 percent of all rounds. Surprisingly, alliance players were happy about their actions. They felt like they were being cooperative and social, and didn’t feel guilty about the costs they imposed on others. They also rationalized their behavior, saying that forming an alliance is a justifiable strategy, while also concealing it by lying when explicitly asked in a later survey if they had formed an alliance. These insights are important when considering how to combat back-scratching in the political world; people will attempt to delude themselves about the morality of their actions. I tested two institutional changes in the experiment after the initial 25 rounds that were designed to combat back-scratching. The first was a randomization mechanism that picked the next round allocator of the gift with a degree of randomness, and was designed to mimic policies of staff rotation, which are standard in areas such as auditing and customs. Think of this as a random choice of new staff rather than a choice of staff with industry experience who are revolving into the organization. Second was a policy mimicking bureaucratic procedures to limit the size of favors able to be allocated with discretion, which decreased the gift each round from $25 to $3, making the payoff from an alliance lower than not being in one. This low-rent treatment I describe as a McDonald’s-ification of decisions; take away discretion for decision makers, such as politicians and regulators, and have them follow a set procedure for major decisions. In a McDonald’s bureaucracy I can’t give away free burgers to my mates, but at my uncle’s burger shop where I have supreme discretion, I can give away burgers with near impunity. Somewhat surprisingly, the staff rotation policy didn’t curtail back-scratching on average because it allowed two competing alliances to take temporary control and make favors. It was a lot like choosing a referee from two competing football teams at random; the referee stayed loyal to their team and their favors still made the game inefficient. However for those groups who had not yet formed strong alliances, it did deter them from forming. The opposite was the case with the low-rent policy. Those groups who didn’t yet have alliances emerge from favoritism saw them start, possibly because the cost of doing so to others had decreased as well. Those groups with strong alliances did see reductions in favoritism and an improvement in group outcomes. This could be a reason organizations seeking internal fairness routinely implement such extensive policies and procedures, because it does stop friends doing favors within the organization. Other notable observations are that social norms are very strong. In the experiment, like we see in real life, groups where some people are observed ‘doing the right thing for the group’ quickly lead to this becoming the norm, whereas where favoritism is observed in early rounds, the group descends into counterproductive back-scratching. Another observation is that it pays to be loyal, but not too loyal. If your alliance partner fails to come through with favors it pays to look for someone else whose back needs scratching. None of this is really rocket science. If this sounds obvious to you, then you’ve probably learnt a lot about human behavior through life experience. It also means the experiment is capturing some critical elements of real phenomena. Independence requirements. While many regulatory agencies feel the need for staff to have industry experience, this experience comes with a set of alliances to others. However, if staff come from other countries (or states) they may still have industry experience, but no tribe-like relationships to the people in the companies being regulated. Cooling-off periods. The flip-side of this is to have quite long cooling-off periods for government and agency staff. The intention is that during this time the value of relationships depreciates as new people and policies emerge in different organizations, changing the structure of any insider group and reducing the ability to repay favors with future favors. Internal rule systems. Reducing the amount of discretion that any particular employee has in a regulatory agency, even at high levels, will ensure that any favoritism requires the cooperation of a larger group. Voting systems that require high levels of approval, multiple levels of oversight, and transparency of information flow and decisions, are simple and possibly effective interventions. These are not new or radical ideas when it comes to tackling the inefficiencies of the revolving door. But they are grounded in the theory that people will invest, through their favors, in cooperating at different group levels if it potentially pays to do so, and they are informed by experimental evidence. In matters of economics and politics, group formation through favoritism is probably the primary driver of success. You can even envisage countries themselves as a loose alliance of insiders looking to do what’s best for their members even when it comes at a cost to other countries. Successful countries ensure that the incentives are to cooperate at the country level and avoid costly back-scratching at lower group levels. Multi-level selection is all around. Morality evolved to enable cooperation, but this conclusion comes with an important caveat. Biologically speaking, humans were designed for cooperation, but only with some people. 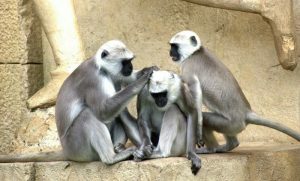 Our moral brains evolved for cooperation within groups, and perhaps only within the context of personal relationships. Our moral brains did not evolve for cooperation between groups (at least not all groups). How do we know this? Because universal cooperation is inconsistent with the principles of natural selection. I wish it were otherwise, but there’s no escaping this conclusion. Our tribalism is biological. This is why corrupt back-scratching is so hard to eradicate, and why it seems to pervade to many aspects of life.